The 567 is a full double horn with a basic design. Its easy response and sure note centering make it ideal for students – while its colorful tone and precise intonation make it attractive to professionals. This instrument was created with the player in mind, down to the smallest components, such as an adjustable 4th valve thumb lever and water key. Leadpipe taper The taper of the leadpipe improves response and intonation throughout the instrument. Wrap The wrap of this model allows for a more comfortable hand position and smoother air flow. Nickel silver inner and outer slides The use of nickel silver inner and outer slides ensures better fit and less chance of corrosion because nickel-silver is harder and more durable than brass. Tapered valves Tapered valves wear for a long time without air leakage. Adjustable 4th rotor thumb lever The 4th rotor thumb lever can be adjusted to fit any hand size from small student hands to large adult hands. Easy response and sure note centering The ease with which this horn may be played makes it ideal for students. 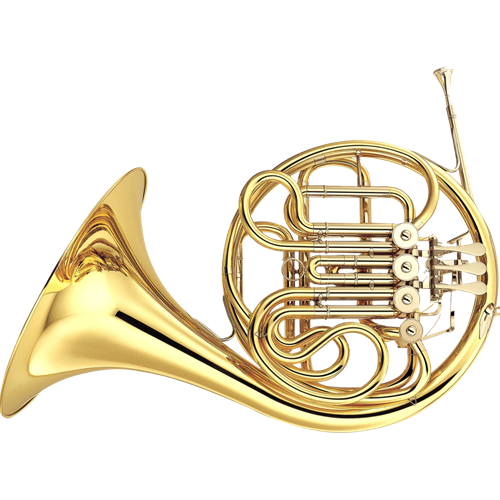 Excellent sound in all registers The combination of the secure high register, strong projection, and quick attack of the Bb horn with the rich, warm timbre of the F horn make the double horn ideal for most playing situations. Available feature The YHR-567 horn is available with a detachable bell (YHR-567D).